If you wish to print out this page, it is best printed in ‘Landscape’. This page is being written with the express direction and permission of Doug Schoon. Doug has more than 20 years experience as a chemical researcher, lecturer and educator. 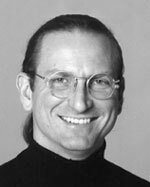 He is the president and founder of the Chemical Awareness Training Service based in Newport Beach, California. He has authored dozens of articles and lectured nationwide on the important topic of salon chemical safety. Doug has served as an expert witness in legal cases helping attorneys, judges, and juries to understand the chemical complexities of professional and retail beauty industry products. Is it no wonder why he is my ‘chemical mentor?’ Kudos, Doug, and a big thanks for helping me out once again! In order for the products to properly adhere to the porous surface of the nail plate, one must begin with a clean start. A clean start begins with simple hand-washing and scrubbing the nail plate to remove surface oils and other contaminates that interfere with proper adhesion. Nail scrubs will do much more than remove oils. Scrubs get rid of bacteria and fungal spores which lead to infections. Skipping this step is the major cause of nail infections, and can also cause enhancements to lift at the cuticle. One of the most dangerous misconceptions in the professional nail industry is that products don’t stick unless you “rough up” or ‘etch’ the nail plate. This is absolutely false and very harmful to clients. Heavy abrasives strip off much of the natural nail plate, leaving it thin and weak. This leaves no supporting structure for the enhancements. Rough filing also damages the nail bed; it promotes allergic reactions and causes painful burning sensations, infections, loss of the nail plate, product lifting, and breakage. Thin nails are more flexible. This extra flexibility allows the enhancement to bend too easily, and creates invisible, hairline fractures that lead to breakage. Creative Nail Design Systems, Inc. Highly magnified microscopic crack in the surface of a polymer. This crack is approximately ten microns wide or 1/10 the thickness of a human hair. Heavy abrasives and high-speed drills generate lots of heat which is produced by friction. This heat leaves the nail bed sore and damaged; heating the nail bed to over 150° F. Need to rough up the nail plate to get good adhesion? Then something is wrong! Many nail technicians have great success without roughing up the nail plate. Why? The answer is simple; they properly prepare the nail plate, use correct application techniques, and high quality products. Lifting problems can always be traced back to one of these three areas. Monomers are like Tinkertoys ®; they can be arranged and rearranged into almost unlimited combinations. Monomers can hook together into extremely long chains; each chain containing millions of molecules. Very long chains of molecules are called polymers. Polymers can be liquids, but they are generally solids. Chemical reactions that make polymers are called polymerizations. Sometimes the term cure or curing is used, but it has the same meaning. A monomer is a molecule that makes polymers. It takes an initiator molecule to begin this chemical reaction. The initiator molecule touches a monomer and excites it with a boost of energy. Monomers prefer the quiet life; they don’t appreciate too much excitement, so they look for ways to get rid of the extra energy. They do this by attaching themselves to the tail of another monomer, passing the energy along. When this reaction begins, monomer chains sprout up everywhere. They grow longer and longer, becoming knotted and tangled until they are a teeming mass of microscopic strings. This game of ‘tag’ continues the chain of monomers becomes longer and longer until the growing polymer chain can’t find anymore monomers. Once the monomer is all gone, the chain reaction stops and the polymer is formed, although the chemical reaction is not finished. The surface may be hard enough to file, but it will be days before the chains reach their ultimate lengths. A polymer with too much cross-linking is brittle and easily shattered. However, cross-linked polymers can be made stronger with IPN’s (Interpenetrating Polymer Network). Imagine weaving a strong polymer rope through the holes of the cross-linked net. This rope will add strength to the net without causing brittleness. All polymers shrink when they form, there is no exception in any nail product. Monomers don’t normally touch each other and bounce around the container at high speeds trying to avoid other monomers. They join only when the conditions are right, and then they embrace very tight. Imagine billions of monomers suddenly coming closer together — the effect is very noticeable. In fact, nail enhancement polymers shrink between 3-20% with some shrinking more than others. Excessive shrinkage (above 12%) causes many problems, such as lifting, tip cracking, and other types of service breakdown. Over cross-linking causes excessive shrinking, too. Tightly woven nets shrink more than loose weaves. The effects of shrinkage can usually be seen. Too much shrinkage may cause product to lift in the center of the nail plate and can often look like a ‘bubble’. One way to control shrinkage is by following the manufacturers’ directions. Improperly mixing (too wet a consistency) and incorrect curing polymers may cause excessive shrinkage and other more serious problems. Energy is the final key to understanding how monomers become polymers. All monomers need energy to make polymers. Initiator molecules control everything. They are the starting gun that begins the monomer race. Some initiator monomers gets their energy by only absorbing light energy while others absorb only heat energy. Light-cured products are energized into polymerizing by absorbing light energy, usually UV (ultra-violet) light. Not all light-curing products use UV light — some have initiators that use visible light. Sunlight and even artificial room lights can start polymerization in the container. Heat-cured products use the heat in the room and body heat to cause polymerization. Many monomers cure at room temperature, 68° – 74° F. Tip adhesives (also monomers) and wraps are examples. A few products require normal incandescent light bulbs — these are not light-curing monomers. They are using the extra heat released from the light bulb and are still heat curing. Catalysts are used in nail products to make chemical reactions happen faster. They are like the trigger on the starting gun, making the initiator molecules work faster and more efficient. If one of these ‘parts’ is missing, initiator, energy or catalyst, the chemical reactions will happen much more slowly or not at all. When two monomers join, an extremely small amount of heat is released. This is called an exothermic reaction. This happens with all types of nail enhancement products; however, some release more heat than others. One normally cannot feel the heat released from two monomers, but remember — it takes billions of monomers to make a nail enhancement. Can you feel the heat from this exotherm? The answer is definitely yes! Under certain conditions it can be quite noticeable, especially for monomers used to make wraps and light-cure products. Unless the heat causes your client to become uncomfortable, you should not be overly concerned. However, exotherms that burn the clients’ nail beds can cause damage to the tissue and weaken the enhancement. The warmer the monomer, the faster it will cure. If the room temperature is too warm or the table lamp is above 60 watts, the extra heat makes monomers react faster. Sometimes, your client will feel their nail beds become very warm, even hot! It takes time to do things right; faster isn’t always better. Faster means more heat in a shorter time and can lead to uncomfortably warm exotherms. It may also cause enhancements to lose some flexibility and lower toughness. An exotherm can reach in excess of 170° F! Unhealthy or damaged nail beds may be the reason for clients complaining of burning sensations, as they are very sensitive to heat. Even tiny exotherms are easily felt on these overly sensitive tissues. Generally, the primary reason for unhealthy nail beds is over filing and over priming. The heat from heavy abrasives and high-speed drills are usually the culprits. Drill bits use friction to cut away the surface. Friction creates heat, and a lot of it! Even light abrasive files and drill bits can cause nail bed damage. Filing too hard, too often, or for too long makes nail beds sore and sensitive. Metal forms can act as a catalyst and cause extra exotherms, but rarely will it cause burning. Nipping lifted material will literally ‘rip up’ good tight layers of product along with vital nail plate layers, making them more sensitive to exotherms. Nail primers must be used with caution as some are very corrosive to skin. Nail primers, like most professional nail products, should never touch the skin. To do so can cause painful burns and scars. Nail dehydrators (Prep) are extremely important. Moisture can interfere with the adhesive bond which leads to delamination or lifting. To ensure proper adhesion, always scrub the nail plate, dry thoroughly and dehydrate. Skipping one step will lead to delamination and may also contribute to infections. Some preparation products contain pathogen fighters that remain on the nail plate to aid in the prevention of nail infections. The effects of dehydration are apparent for up to 30 minutes before the natural moisture levels are restored by the body. sticks strongly to the nail plate, but is soft and dull looking. solvent slowly evaporates, leaving the remaining ingredients. added with other colored pigments to reduce the number of coatings. “Contains no Formaldehyde” is seen on some nail enamel or polishes. Should formaldehyde be a concern for nail enamel users? In most cases, no! The negligible amount found in enamel is extremely safe. One exception is the prolonged use of products with more than 1% formaldehyde. At these levels, formaldehyde may cause severe allergic reactions. Fortunately, most nail enamels contain less than 0.0015% formaldehyde. This tiny amount comes from an important ingredient called toluene sulfonamide formaldehyde resin (TSF resin). This resin is very different from formaldehyde in that it will not cause problems unless the client is already allergic to formaldehyde, i.e., from the use of formaldehyde nail hardeners. Nail hardeners may legally contain as much as 3% formaldehyde. Concentrations above 1% will cause the natural nail to stiffen and lose flexibility. Clients usually confuse this stiffness with strengthening. They incorrectly assume that harder nails must be stronger. Although the nail actually bends less, it has actually lost strength. Prolonged use of formaldehyde causes the nails to become split, dry and brittle. Toluene has been safely used in nail enamels since the 30’s. In the 90’s toluene has become a very controversial ingredient. Paranoid politicians passed a state law in California that basically says that safe is not safe enough. California law requires exposure to be thousands of times below the federal safe-exposure level. Because of a lawsuit, the state of California asked for a study which would determine the level of toluene in the average salon. The study showed that the level of toluene found in salon air is more than 200 times below the federal limits. In other words, the air would still be safe to breathe even if the toluene vapors of 200 salons were put into one salon. Toluene is used to dissolve other ingredients in nail enamels. Polishes with toluene apply smoother and produce more brilliant colors that resist peeling. No other solvent does as good a job as toluene. Toluene sulfonamide formaldehyde resin is a polymer produced from each of the chemicals in its name. This particular polymer is widely used to increase the strength of the primary nail polish polymer, nitrocellulose. Hypoallergenic polishes usually contain a polymer resin which makes the polish about 10 – 20% less durable. Another alternative is toluene sulfonamide epoxy resin. This polymer has slightly better properties than the polyesters; however, polishes that contain this resin suffer from poor shelf life. Neither can it compare to TSF resin for strength and durability. Nail technicians use many types of products to create artificial nail enhancements. Light-cure gels, liquid-and-powder systems, wraps and no-light gels all seem totally different and unrelated, but nothing could be further from the truth. The monomers used to make each of these are very closely related and, in fact, come from the same chemical family, the acrylics. The ‘liquid’ is really a complex mixture of monomers. The ‘powder’ is a polymer which contains the initiator and other additives. The polymer acts as a carrier, holding other ingredients — some of which are coated on the outside of the polymer. The mineral titanium dioxide is used to create a more natural appearance. This is the same pigment used in white house paint and children’s finger-paint. Dyes are added to give the polymer a pinkish or bluish color. Pink dyes will also cover-up yellowing and product discoloration. Blue coloration acts as an optical brightener; whites look whiter when a small amount of blue is added. A heat-sensitive initiator is added to the polymer; usually benzoyl peroxide. This is the same initiator that is found in acne creams. The heat of the room and hand is enough to break a molecule of benzoyl peroxide in half. Each half is capable of exciting or energizing a molecule. When a molecule breaks in half, it is called a free radical. Free radicals also play a role in wrinkling and aging. Many skin care products contain chemicals which eliminate free radicals — so, as you can see, some free radicals are beneficial while others are not. Free radicals are very excited molecules that cause many kinds of chemical reactions and can be found almost everywhere. Once a free radical excites the monomer, it is completely eliminated. Monomers are mixed with polymers containing benzoyl peroxide. Heat will break the initiator in half, and each free radical will energize a molecule. The energized monomer will attach to another monomers tail, passing the energy along until all the monomers are hooked together into a teeming mass of long chains. Only the monomer can make a new polymer. The growing chains of monomer wrap around the polymer. The polymer powder does NOT react; it is only a carrier for the initiator to the monomer. So where does the polymer powder come from? As you might suspect, the polymer powder starts out as monomer. The monomer is placed in a large mixer which may hold over 1000 gallons. solvent is added to dilute the monomer, initiator and catalyst are added and the blend is mixed rapidly. After several hours, the monomer polymerizes into tiny beads, the solvent is drained away, and the beads are dried and packaged. Too dry a consistency causes breakage and lifting, but too wet a consistency is worse. If the mixture is too wet, the enhancements may seem strong , flexible, and adhere well to the nail plate, but don’t be fooled. Too wet a consistency is one of the leading causes of allergic reaction in clients and nail technicians. Wet consistencies may give better adhesion, but they lower strength. Dry consistencies have equal amounts of monomer and polymer and offer the best strength, but less adhesion. Medium wet consistencies give the best of both worlds; they are strong, flexible and offer good adhesion. A medium-wet consistency is a mixture of 1 1/2 parts monomer to 1 part polymer. To determine if your consistency is correct, make a bead in your normal fashion. Carefully lay the bead on top of a clean, unfiled tip, placing the bead directly on the center or the apex. Do not pat or press the bead — it should form a small mound or dome. Watch the bead for 15 seconds and note what you see. Does the bead begin to settle or flow out almost immediately? Does the height of the bead drop halfway or more in 15 seconds? Does the bead seem to lose most of its original shape? Can you see a ring of monomer around the base of the bead? If you answered yes to any of these questions, your bead is probably too wet. If you answered yes to all of these questions, your ratio is probably greater than 3 parts monomer to 1 part polymer. The monomers used to create wraps are called cyanoacrylates and are members of the acrylic family. They are the same monomers used to create many fast setting adhesives such as Krazy Glue.® Professional nail products are specifically designed for use on fingernails and are far superior for this application. These monomers are sensitive to alcohol, water, and weak alkaline substances, and in large amounts they can cause almost-instant polymerization. A drop of water or alcohol on wrap monomers will cause ‘shock cure”. They will harden quickly and turn cloudy white. They turn cloudy because shock curing causes thousands of microscopic crack. They are invisible to the eye, but the cracks will scatter light reflecting from the surface. Small amounts of these substances cause slower, controlled reactions which result in polymers which are clear, flexible and strong. Wraps, however, do not have the advantage of being cross-linked. Catalysts speed up the polymerization and reduce cure time from minutes to seconds. Spray or brush-on catalyst causes an almost-instantaneous reaction. The catalysts in wrap systems are generally weak alkaline substances which may be listed as “aromatic amines’. Rapid reactions cause rapid heat build-up. Incorrectly used, these catalysts may heat the nail plate to a blistering 170° F. A small amount of warming is beneficial and will improve strength; however, pain-causing heat may cause serious burns to the nail bed. To avoid over-heating, some catalysts must be sprayed from a distance. Always wear the proper mask when using these systems to protect yourself from the vapors of mists and sprays. Certain types of cyanoacrylates are used as tip adhesives and are formulated differently. They are sensitive to moisture and work best when there is no air. Most set slowly or turn to a rubbery gel in the presence of air. When the air supply is cut off, the adhesive quickly sets. This feature is beneficial for the nail technician, allowing maximum working time and a quick set once the tip is properly placed. Thinner adhesives set faster, but this is not always good because extremely fast setting adhesives give lower strength. If you have a client whose tips just don’t seem to hold or they separate in a few weeks, try a slower-setting thicker adhesive. Thin adhesives work best if the tip to nail plate fit is perfect. If there is a gap between the tip as there generally is with ski-jump nails, nails with missing sidewalls, bitten or broken nails, then the thicker, slower setting adhesives will give the best retention. Thicker adhesives (gel adhesive) will fill in the gaps and irregularities and allow for a tighter bond. With gel adhesives, less is more. These adhesives usually contain dissolved methacrylate powder to give the bond more strength, especially in the gaps. Some adhesives contain special wetting agents which help improve nail adhesion, strength and clarity. Since these adhesives are not cross-linked, they are affected by moisture. Clients who frequently wet their hands should be warned that all cyanoacrylates are moisture sensitive, and should be instructed to wear gloves whenever possible. This is true of both adhesives and wraps. The word “glue” is commonly misused — especially in the professional nail industry. People often use this term to mean anything that is sticky. Glue is a name for a certain type of adhesive. True glues are adhesives made from animal protein, hide, bones and hooves. No professional nail adhesive is made from animal by-products, so it is incorrect to call them ‘glues’. The proper term is adhesive. The professional nail industry uses advanced monomer adhesives, not glue! Various types of fabrics are used to reinforce the polymer wrap coating. These fabrics provide support and added strength to the coating. There are three fabrics in wide use: fiberglass, silk and linen. the type of fabric is not as important as the weave. The weave and thickness of the fabric determine its usefulness; the monomer must be able to penetrate the weave, soaking completely through the fabric. If the monomer sits on top of the fabric, it leaves tiny spaces or voids between the monomer and the fabric’s fibers. These voids create weak areas where cracks may later develop and grow. If the monomer absorbs easily into the fabric, the coating will be stronger and clearer. Proper wetting allows the monomer to cover the surface more thoroughly, penetrate deeper, and hold tighter. Fiberglass and silk are very similar in properties. Silk is more easily wetted and creates a more natural appearance. If properly applied, both silk and fiberglass create thin, strong and natural-looking enhancements. Linens tend to be thicker and tightly woven, making it difficult for the monomer to penetrate the fabric. The result is thick, cloudy coatings that must be worn with polish to cover the unnatural appearance. Because the monomer cannot completely wet the linen, these fabrics can lift and peel away (delaminate). Medium-weave silk and fiberglass provide the best overall combination of strength, retention, clarity and wetting. Skin oil and other contaminates can block wetting. Touching fabric will deposit large amounts of skin oil on the fabric. To eliminate many of the problems associated with wraps, including lifting, peeling and cracking, avoid touching the fabric with your fingers. UV or visible light-curing gels have been around for many years, but have recently gained popularity. Newer products are beginning to meet the tough demands of the professional nail industry. Since these systems can use either visible light or UV light to create enhancements, the term “gel” will be used when referring to both types of products. This term is misleading and suggests that these are like regular UV gels because they need no light. Not true! These products are wrap monomers that have been thickened to have a gel-like appearance. They should be used and handled as any other wrap product. They have most of the benefit and disadvantages of the other wrap products. Many feel that the gel wrap product is easier to use because it is thicker; however, thicker monomers will not wet fabric as easily. Gels are often sold as being ‘not acrylic’, but in fact are based on both the methacrylates and the acrylates family. Polymerizing monomers with UV or visible light is not very efficient as it is difficult to get the UV light deep into the gel. If gels were made entirely of monomers, most of the gel would not turn into a polymer. One way to improve efficiency is to pre-join some of the monomers into short chains. These short chains are neither monomers or polymers — they are in between: oligomers. Oligomers make it easier to create polymers. An oligomer is a single chain that is several thousand monomers long. Joining a few hundred oligomers is much faster than joining a million individual monomers. Why are gels so thick? Nail enhancement monomers are liquids and polymers are solids, so it makes sense that oligomers are in between. this is why gels are ‘gel-like’ inconsistency. Now you can understand one of the disadvantages of most gel systems. They are more difficult to use because of their heavy consistency and their tendency to be stringy. On the positive side, the thicker consistency reduces evaporation and odor. Some initiators use heat energy and others use light. It is easy to keep light away from gels so the initiator, catalyst, and oligomers can be combined together into a single product. This is possibly one of gel’s greatest advantages. They come premixed and ready to use. Still, no system is perfect. Each has advantages and disadvantages. Curing with UV or visible light is more convenient, but raises special problems that must be addressed. Since initiators are activated by light, they must penetrate completely through the gel to polymerize all of the oligomers. Unfortunately, this does not occur. Thick coatings of gel allow less light to reach the bottom layers. In Europe where gels are used extensively, they attempt to overcome this with powerful UV lights. these systems use 38-40 watts of UV light. American systems tend to be far lower, usually 8 watts. UV bulbs emit only UV-A, so there is little danger. However, the high-wattage lamps are far more expensive and can cause problems as well. Remember, when polymers cure too quickly, they release large amounts of heat in a short period of time. This can cause serious and damaging burns to the nail beds. As a rule, the thicker the coating, the less efficient the cure. It is much better to use three or four thin coats rather than one or two thicker coats. Thinner coats allow more light to penetrate the layer. Also, the hands will be under the gel light longer if more coatings are used. Another advantage is reduced shrinkage. Gels shrink more than any other type of enhancement. Using thinner coats reduces the effects of shrinkage. Bulb condition is vital to the success of gel enhancements. UV lamps become ineffective many months before they burn out. After about 6 months of normal use, a bulb has less than half its original UV energy. UV bulbs should be changed twice per year even if they look fine. If the product seems to set slower than normal, change the bulbs immediately. Clean the bulbs whenever needed or at least once per week. Finally, the type of oligomer used plays an important role in skin allergy. Since acrylates tend to cure much faster, they are more likely to cause allergic reactions. For this reason, acrylate monomers are rarely used in monomer-and-polymer formulations. The stickiness of gels also contributes to allergies because the sticky gel is more likely to remain on implements and skin. Gels should NEVER be allowed to touch the skin — NEVER touch your clients cuticles, either. If contact occurs, immediately cleanse the area with soap and water. Jeep brush handles, files, containers, and implements free of gel. As gel ingredients become more sophisticated, the products will improve and many of the problems associated with gels will no longer haunt nail technicians. Most people believe chemicals are dangerous or toxic substances. Ask someone about chemicals and they might mention toxic waste dumps or factories dumping poisonous waste into streams. Actually, everything we see and touch is a chemical, except for light and electricity. Air is a combination of many chemicals; oxygen, hydrogen and nitrogen. Clean, pure mountain stream water is a chemical. A newborn baby’s skin is 100% chemical. Why do people only think of chemicals in a negative way? It is because of the dramatized and exaggerated images created by the media. These images are misleading and inaccurate. The truth is, 99% of the chemicals we come in contact with in our lives are completely safe and beneficial. Water is the most common salon chemical. Water can be very dangerous! In fact, it can kill you within minutes. Try sticking your head in a bucket full of water for 5 minutes. Foolish? Yes! Since we were very young, our parents taught us the potential hazards of water; it is dangerous to swim after a big meal or use a blow dryer in the bathtub, and not to drive fast on wet pavement. We all learned the rules, and the same holds true for salon chemicals. There are ‘safe working’ rules we must follow, or we will suffer the consequences. Every chemical can be safe and every chemical can be dangerous — it’s up to you! No chemical in the world can be harmful unless you overexpose yourself. Every chemical substance has a safe and unsafe level of exposure. Simply touching, inhaling, or smelling a potentially hazardous substance can’t harm you. Exceeding the safe level of exposure is the danger we must learn to avoid! Some chemicals are dangerous even in tiny amounts and are not suited for salon use. Professional products are formulated to be as safe as possible, though no nail product or other cosmetic product is free from all risks. A normally safe product can become dangerous if used incorrectly. Even gardeners and mechanics must follow safe working procedures. Material Safety Data Sheets provide information to all chemical workers, including nail technicians. MSDS help firefighters deal with chemical fires or clean up large spills, and doctors to treat accidental poisonings. Any professional product that contains a potentially hazardous substance has an MSDS. What can you learn from an MSDS? Potentially hazardous ingredients found in each product. Proper storage and fire prevention. Ways to prevent hazardous chemicals from entering the body. The short and long-term health effects of overexposure. Early warning signs of product overexposure. There are only three ways that a potentially hazardous chemical can enter the body. If you block these ‘routes of entry’, you will automatically lower your exposure. Inhalation by breathing vapors, mists, or dusts. Absorption through the skin or broken tissue. The human body is very rugged and complex, giving early warning signs of overexposure. Unfortunately, these symptoms are often ignored. For instance, overexposure to some solvents can make you feel very tired or keep you from sleeping. Overexposure can cause headaches, nausea, angry or frustrated feelings, nosebleeds, coughs, dizziness, tingling fingers and toes, dry or scratchy nose and throat, puffy red and irritated skin, itching, and many other symptoms. Watching for these acute symptoms will help you avoid more serious, long-term problems. Accidents happen when they are least expected. What would you do it a small child ran up to your table and drank from your bottle of primer? The MSDS will provide emergency numbers that may safe a life. Keep products capped or covered when not in use. Empty waste containers regularly. Just because you don’t smell anything doesn’t mean there are no vapors in the air. Keeping products closed will drastically reduce the amount of vapors released by ‘volatile’ or evaporating liquids. Avoid pressurized spray cans and use metal waste containers with pop-up lids. Surgical type masks (often called dust masks) are completely ineffective against vapors. These masks should only be used to keep dust particles out of your lungs. Never use a dust mask to protect yourself from vapors. Vapors are far too small to be ‘filtered’ by dust masks. Use a mist mask if you spray anything. Some high-quality masks are also effective against mists. These are called mist-rated masks; however, they too are ineffective against vapors. Always wear a dust mask when filing, especially if you use a drill. Our lungs can handle a lot of dusts because it has ways of removing and disposing of inhaled dusts. When you inhale more than the lungs can handle, you increase your risk. Drills make much smaller dust particles than files or emery boards. These smaller particles lodge deeper into the lungs, making them more hazardous to your health. Drills spin in a clock-wise direction and will actually ‘throw’ the dust in your face, and remain in your breathing-zone up to 60% longer than the dusts from hand filing. These smaller particles will settle on every surface and even the slightest breeze will send them back into your air. Never judge product safety by odor. What is the most dangerous misconception about chemicals in the salon industry? Many believe that they can tell how safe or dangerous a chemical is simply by its odor! Wrong! A chemical’s smell has absolutely nothing to do with its safety. Some of the most dangerous substances known have very sweet, pleasant fragrances. Never smoke, eat or drink in the salon. Always store food away from salon chemicals and wash your hands before eating or going to the restroom. A cigarette lighter will produce a spark that may ignite flammable liquids and vapors. Coffee cups can easily collect dusts. Hot liquids, like coffee and tea, will absorb vapors right out of the air. Dusts can settle on your food, and your food can absorb the vapors. Think not? Lay a piece of bread on your table in the morning, then take it outside with you at the end of the day. What is that smell? Chemical vapors! You should always wear approved safety glasses whenever you work and should give your client a pair to wear as well. Your client may love you and think you are the greatest nail technician in the world. But, if you accidentally splash primer or wrap monomer in their eyes, you have lost a friend and gained a lawsuit! You are responsible for the client’s safety while in your care. Soft contact lenses can absorb vapors from the air — never wear contact lenses in the salon, and wash your hands before touching the eye area. Wearing contacts while in the salon is risky as vapors will collect in the soft lenses and make them unwearable. Even if you wear safety glasses, the vapors are still absorbed. The contaminated lens can etch the surface of the eye and cause permanent damage. Should an accidental spill occur, the liquid will ‘wick’ under the lens, making proper cleansing of the eye more difficult. Organic simply means the chemical contains carbon in its structure. Most things on earth are organic. Cow dung, poison ivy, and road tar are all 100% organic and natural. Natural simply means “occurring in nature.” Nature is a wicked place; filled with poisonous substances. Natural doesn’t mean a product is safe, wholesome, or even better. Don’t judge a chemical by what it CAN do — what’s important is how easily you can prevent the potential hazard. Alcohol (in beer and wine) CAN cause liver damage — if you drink a couple quarts a day for 5 years! It won’t happen because you have a margarita with lunch. There is no need to fear chemicals, just be careful and wise. Know your products, read and understand the MSDS, read all product warning labels, and follow the manufacturers application guidelines for all your salon products. To reduce exposure to vapors, ventilate, don’t circulate! 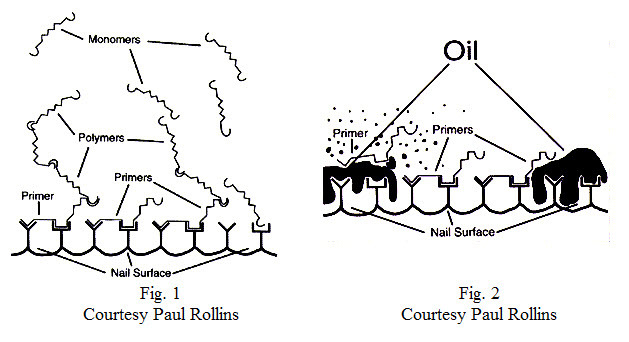 For a greater understanding of the chemicals we work with, how and why they ‘do what they do’, see: Nail Structure and Product Chemistry by Douglas D. Schoon for Milady’s.